‘Fruit above the middle size, very regularly formed, rather narrower at the crown than at the base. Eye generally close, deeply sunk. Stalk an inch long, slender, deeply inserted. Skin dull yellow, sprinkled with numerous, small, russetty, green, and white spots; on the sunny side of a rich, deep, dull red, streaked and mottled. Flesh very firm, crisp. Juice plentiful, with a delicious aromatic, sub-acid flavour. A dessert apple from November till May or June.’ [George Lindley – Orchard guide p.44/1831]. ‘Under the name of Reinette dorée, or Golden Reinette, are confounded at least four distinct varieties; — firstly, the true Golden Reinette of England; secondly, the Reinette dorée of some Dutch Gardens; thirdly, the Reinette dorée of Mayer's Pomona Franconica, which is the kind now figured; and fourthly, the Reinette dorée of Duhamel, Knoop, and others, which is the Späte Gelbe Reinette of the Germans. Of these four, the most valuable is undoubtedly that now figured [‘Dutch Mignonne’]. It was originally made known to English Gardeners by Mr. George Lindley, who procured scions from the Garden of a Norfolk gentleman, by whom it had been imported from Holland, and who, not knowing what it was, called it the Dutch Mignonne. In Yorkshire it is known by the name of the Copmanthorpe Crab, an appellation which is better abandoned, as no one would expect to find a Crab of the high excellence of this.’ [PM t.84/1829]. ‘The tree is hardy, a vigorous grower, and a very abundant bearer. It attains about the middle size when fully grown. The shoots are thickly set with fruit spurs. It is well adapted for dwarf or espalier training, and for these purposes succeeds well on the paradise stock.’ [Hogg p.74/1851]. 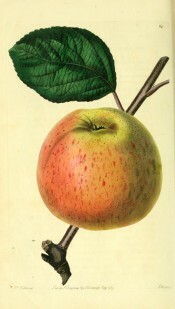 Listed as ‘Dutch Mignonne, apple no.77’ in a hand written list of apples in an 1850 catalogue held at Camden Park [CPA]. Most of the plants hand-written in this catalogue subsequently appeared in the 1857 catalogue. That the apples did not is probably an oversight.